The perfect solution for busy travellers looking to dodge the transfer bus and grab a fast getaway. Simply drive to the short stay car park, unload your bags and head straight to the check-in desks - while your car is parked for you. It's the ultimate in arrive-and-fly parking. 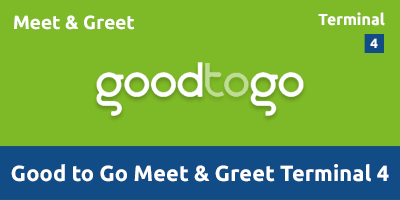 Good To Go Meet & Greet T4 is suitable for Blue Badge holders. If you are using a sat-nav, please enter the postcode TW6 3YD. Leave the M25 at Junction 14 and follow signs to Terminal 4 along Airport Way (A3113). At the next roundabout/traffic light junction, go straight across onto the Southern Perimeter Road. Cross the next roundabout and progress through three sets of traffic lights. Take the slip road signposted Terminal 4 following the signs for Short Stay Parking. Once parked, register your arrival at the Meet & Greet Reception opposite the car park. View Good To Go Meet & Greet T4's location on a map. Meet & Greet operates 05:00 - 23:00 daily. Please call 0758 351 6491 and let Good To Go know about any changes to your arrival time.